Discussions on operations and strategies at Working Group for Open Science Research Data Infrastructure WG, Organization for Science Network Operations and Coordination. Education and Study on Information Retrieval, Information Behavior, Digital Library, and Digital Document Services. Developing an digital library system and researchers directory for the institute. Operation in a special library at NIMS. One of organizers of NTCIR-5 WEB task. Building a Web test collection. BSc in library and information science from University of Library and Information Science, Japan. Master thesis: "Construction of Information Retrieval System based on Z39.50 Protocol for Bibliographic Data (in Japanese)"
PhD dissertation: "A Study of Cooperative Information Service Systems: Applications to Terminological Systems and Information Retrieval Systems (in Japanese)"
A member of the research unit, in charge of researches on constructing knowledge resources. A member of the research unit, regarding researches on the concept of information practice. A member of the research group, in charge of researches on constructing knowledge resources. A member of the committee for INIS Database. A member of System Technology WG for Japan Link Center. Project member of voluntary community and website on museums, libraries, archives and kominkans (community centers) (MLAK) in Japan stricken by the 2011 Tohoku earthquake and tsunami. 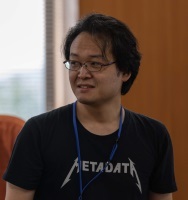 Core member of Japan chapter-like activity of Code4Lib community. Funded partially from Japanese Library Promotion Foundation (2010). Member of Technology support working group for the institutional repository community in Japan. Member of the CRES project for understanding users' information behaviour and information needs on the Web. A collaborator of the project to construct the next generation library system based on Open Source. Design and build a Web-based Metadata retrieval system by Namazu. Member of the student committee for new IT services by Tsukuba city. Proposed building inter-library service systems and utilization of GIS systems. Website management for presentation materials. Conversion into CD-ROM for distribution. Assist for PR/communications for the seminar. Tested features and added access-control feature. Building a web-based browsing system for Japanese national bibliographics Japan/MARC data including 1M-records from over 13 years. Received for publishing Poorman's LOD Toolkit. Received for developing and providing Japanese Textbook LOD Dataset. Received for my educational activities in 2015. Received my contribution to "Developement of Researchers Directory Service, SAMURAI, and Accomplishment on Outreach Activities". A full list of publications are available at ./pub/. Organizing committee member for The Fifth NTCIR Workshop Meeting. Publication co-chair and presentation area co-coordinator.